1. Heat 1 tbsp oil in a frying pan and fry the chicken for 3-4 minutes each side until golden, cooked throughout and with no pink meat. 2. Meanwhile, heat the remaining oil in a small saucepan and fry the onion for 4-5 minutes, add the tomatoes and vinegar, cover and cook for 3-4 minutes. 3. Stir in all but 1 tbsp basil. 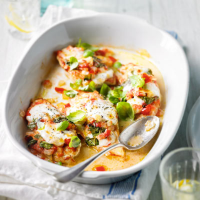 Place the chicken in a heatproof dish, top with half the mozzarella then spoon over the tomato sauce and add the remaining mozzarella. 4. Place under a preheated grill for 2-3 minutes until golden. Sprinkle over the remaining basil to serve. This recipe was first published in April 2014.